If you’re thinking about renting a unit at a storage facility, it’s easy to become overwhelmed by all the options that are available. They can be inside or outside. They can be as small as a walk-in closet or larger than a garage. You can hire someone to move everything for you, or you can do it yourself. At Bargain Storage, our team is happy to help you figure out the type and size of storage unit that fits your needs, whether you’re looking for personal or business storage. The main factor is, of course, what you need to store in it. Let’s start with a quick overview of the different storage types and what they are best suited for. 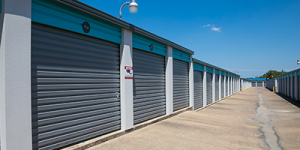 An outdoor storage facility offers row after row of individual units for rent. The facility is usually protected by a fence and a gate with a customer access code. The unit itself is secured by a lock – disc-style locks are often recommended. Staff and security cameras monitor the units to help protect your belongings. Often, you can park directly in front of your outdoor storage unit to unload your items. This is called drive-up storage. Unit may have a roll-up door similar to a garage door or an oversized man-door so you can move large items in and out easily. The units that open directly to the outside are not climate controlled, so make sure to store items that can withstand the weather in your area, such as humidity, freezing temperatures, or the desert sun. Indoor storage units are warehouses or large buildings with rows of individual storage units for rent. Customers use a key or access code to enter the building. Security cameras and staff provide 24/7 surveillance to protect your belongings. If the indoor storage facility is climate-controlled, the temperature and humidity are set to specific level to help protect your items from damage that can be caused by changing weather. 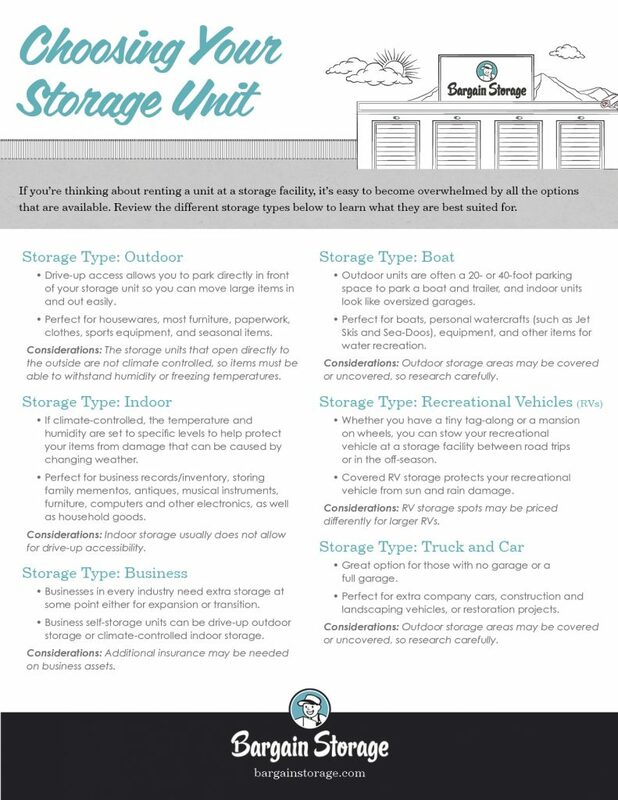 Climate-controlled indoor storage units are well-suited for business records/inventory, storing family mementos, antiques, musical instruments, furniture, computers and other technical equipment as well as household goods. Air-cooled storage units use an effective cooling method to keep the building roughly 15-20 degrees cooler than the temperatures outside. Items that need protection from the heat, but do not need protection from the cold would be ideal to store in this type of storage unit. Companies can deliver a storage unit to your home or office so you can fill it at your convenience. Once you’ve finished, the mobile storage company moves the unit to a storage facility until you call for it to be delivered. While mobile storage is convenient, make sure you understand the various fees involved with it (for delivery, pickup, storage, fuel subsidies) before you sign a contract. This option is the most expensive, but it requires the least effort. Movers come to your home or office to pack your items and move them to a storage facility. Moving company storage is best for executives with hectic schedules or people who are unable to lift multiple heavy boxes. Businesses in every industry need extra storage at some point – to hold items while moving locations, to protect important documents, to or to store extra inventory. 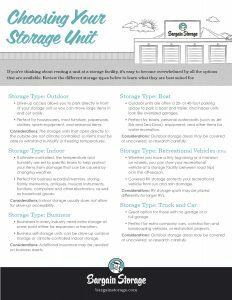 Business storage can be drive-up outdoor storage or climate-controlled indoor storage. Let the type of items you plan to store determine which type of business storage facility to choose. Boat storage facilities can hold your watercraft after a day on the lake or at the end of boating season. Finding the right boat storage facility keeps your boat close to the water – and out of your driveway. Outdoor units are often a 20- or 40-foot parking space where you can park your boat and trailer. They may be covered or uncovered. Indoor boat storage units look like oversize garages and can store your boat, trailer, personal watercraft (such as Jet Skis and Sea-Doos), equipment and anything else that you take out on the water. Whether you have a tiny tag-along or a mansion on wheels, you can stow your recreational vehicle at a storage facility between road trips. Storage unit parking keeps your RV protected inside the storage facility gates with 24/7 security monitoring and keypad-only access — and it keeps it out of your driveway! Covered RV storage protects your recreational vehicle from sun damage. No garage? Full garage? Business fleet? You can keep your vehicles safe in a large storage unit or in an RV storage parking space. This is a great solution for extra company cars, construction and landscaping vehicles, or that sweet ride you plan to restore someday. At Bargain Storage, we want to make sure that you trust the storage facility you are doing business with – whatever your storage needs. Look for a quality storage space at a reasonable price with friendly and experienced team members that are available to answer your questions. Visit our storage facilities page to find a Bargain Storage facility near you. 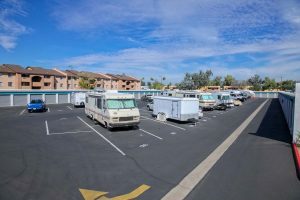 We offer several locations in Arizona, Colorado, Oregon and Texas with various features including air-cooled storage, drive up self-storage, RV and boat parking spaces and more.